Prefer treats to tricks at Halloween? 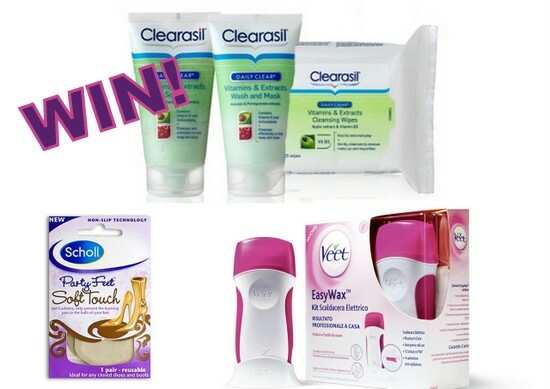 Well here's a fantastic prize that will have you silky smooth and party ready from head to toe! This fabulous pamper hamper will include Clearasil's new gentle Vitamins & Extracts range, which nourishes skin and helps keep it blemish free. You can check out my review of the range over on beaut.ie here. You will also win Veet's award winning Easy Wax Electrical Roll-On Kit, which I love - check out my review here - along with another of my party essentials - Scholl's Party Feet, which help to keep me standing in my stilettos! Finally the Scholl Dry Skin Instant Recovery Cream will help perk up tired feet the morning after. If you're resident in the Republic of Ireland and fancy getting your hands on all of this beauty booty, just enter your info below. Not living in Ireland? There are plenty of great international giveaways that you can find here. Best of luck all! Intrigued by this veet contraption, would love to give it a go! The prizes just keep coming - thank you so much! I love all of these competitions! Ultimate pamper sess is ahead for this lucky winner! I've been meaning to try the new Clearasil range out, any idea on what its like? I could definately do with ALL of these!! My night -out essentials!